From the “Toughest Race in the Northwest” to the “Last Great Race on Earth” dog sled racing requires great endurance, survival skills and harmony between mushers and dog teams to complete these lauded races. Probably the most famous dogsled race and perhaps truly the Last Great Race on Earth, the Iditarod commemorates the 1100 mile (1,600 km) long National Historic Iditarod Trail that mailmen, priests, ministers, judges and supplies traveled during the turn of the twentieth century gold rush. Driving teams of twelve to sixteen dogs cross mountains and rivers with only a few hours of day light. They pass through dense forest and over desolate tundra in temperatures often below zero. Over ten to twelve days, teams compete to prove their strength and finish in the top thirty, for a portion of the £400,000 purse. Moreover, everyone wins; aside from the thrill of accomplishment, the Red Lantern award goes to the last finisher and those who come in after the top thirty walk away with an equal part of £25,000. The Yukon Quest calls itself the Toughest Sled Dog Race in the World. Following the completion of the Iditarod, the race runs more than 1,000 miles from Fairbanks, Alaska to Whitehorse, Yukon. A celebration dedicated to the traders, trappers and gold seekers that explored and settled the unwelcoming lands at the top of North America, top finishers gain a sense connection to their history and part of the £50,000 prize. Before the big races take place, mushers practice at smaller training and fun races. The season kicks off in Alaska with the Sheep Mountain 150 and a new race: The Women’s GinGin 120. The Eagle Cap Sled Dog Race nicknamed Oregon’s Iditarod includes both 100 mile (8 dogs) and 200 mile (12 dogs) races to qualify racers for the real Iditarod and the Yukon Quest. Shorter races cover loop trials from 30-mile sprints to 300-mile mid-distance races, like the Can-Am 300 Crown International in Fort Kent, Maine. The Knik 200-Joe Redington Sr. Memorial Sled Dog Race also leads to the Iditarod, preparing teams in this limited race the first week of January. Though the Iditarod may be the holy grail of dog sled races, some mushers prefer the history, camaraderie and destinations afforded to competitors of less known races. In 1925, a diphtheria epidemic threatened the gold mining town of Nome, Alaska. Twenty dogsled teams from Nenana saved the now established “city” by relaying serum 674 miles in 27.5 hours. Today’s Serum Run participants drive dogsleds and snow-machines through all the towns between Nenana and Nome, spreading the message about inoculations and visiting isolated Alaskan villages. Other races like the Junior & Senior Cheechako races (meaning “tenderfoot” or “newcomer”) held by Chugiak Dog Mushers association in the Anchorage bowl aim to share the joy of dog sledding with curious novices. Mushers are known for their harmony with Mother Nature, taking great care of their dogs and following a policy of leave no trace. France’s La Grande Odyssée embodies that ideal. The early January 200 mile qualifier of the Yukon Quest promotes environmentally friendly values such as “the only trace left by a sled in the trail is two parallel lines in the snow.” And works with Agence de l'Environnement et de la Maitrise de l'energie (ADEME) and Eco Emballages for sustainable development in environmental protection and energy economy as well as recycling policy. They even forbid whips, requiring drivers to use only their voice. National organisations like the Norwegian Sled Dog Racing Association (NHF) and the International Sled Dog Racing Association regulate dog health ensuring traveling dogs get vaccines. 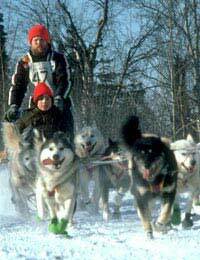 However, every musher knows a trusting relationship with healthy happy dogs directly affect race performance. So drivers meticulously plan and care for their team’s kennel management, canine behavior, nutrition, veterinary care, psychology, physical conditioning, housing and transportation, while also adoring and playing with them. Often the bond between sled dogs and mushers goes beyond athlete and coach to the love of a family member. Such good care is rewarded with more than fast times. At the Gin Gin the musher that demonstrates outstanding care of her teams while remaining competitive receives the Veterinary Care Award. The official Gin Gin 120 Woman is recognised for her outstanding athletic achievement and is an ambassador for the sport of mushing. Sportsmanship awards go to mushers chosen by their peers for kindness and helpfulness on the trail. And many races also celebrate the Red lantern finisher. Throughout the snowbound world, races test musher’s dog training and outdoor survival skills. While dog sledding has a tradition of enduring unbearable weather, their love for the environment and their animals also endures through fast paced title races like the Iditarod and fun races like the Serum Run.